Founded in 1939 and incorporated in 1963, Lee Lim Ming Metal Works (李琳明金屬製造廠) has been making metal pins and badges for large companies (such as Maxim’s, KFC franchise operator Birdland, Cathay Pacific), government agencies (e.g. Police and Fire Service departments) and schools (e.g. St Paul’s Co-Ed) for over three quarter of a century and command a dominant market position. It also manufactures tie-clips, key-chains, cuff-links, car badges, certificate shields, metal plaques, metal clips, display stands and matt finish products. A native of Enping (Yan Ping) in Guangdong province, the firm’s eponymous founder Lee Lim-ming (1902-1987) followed his parents to Manila at an early age where he graduated from the Chinese Middle School. He became a photo etching professional and after the Sino-Japanese War broke out in 1937, Lee moved to Hong Kong where he founded Lee Lim Ming Metal Works. After the War, business took off thanks to his excellent product quality and customer service. The firm established its plant at 3 Dundas Street in Mongkok and a retail branch was established at the Sun Hing Building at 607 Nathan Road. 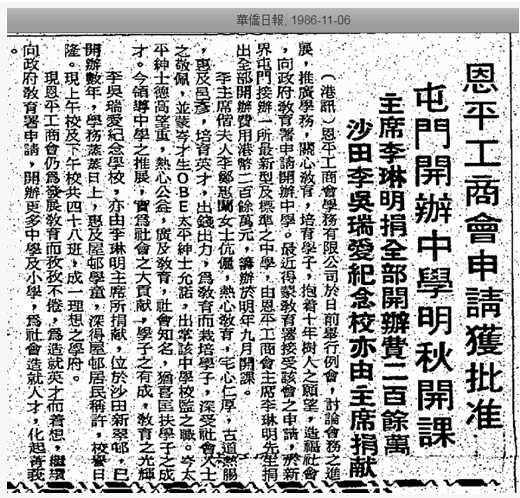 During the 1960s, Lee was active with the Chinese Manufacturers Association and the HK Photoetching Association, both of which he served on the board of and LLM Metal Works participated at the popular HK Products Expo organized by the CMA. 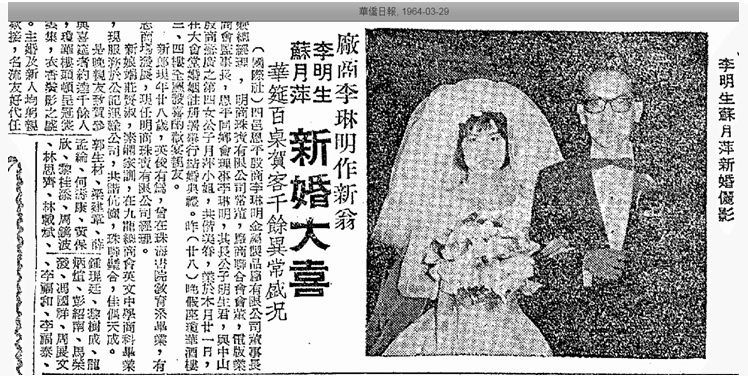 He also expanded into the jewelry business via Ming Sheung Jewelry Co (明商珠寶) and Lee’s only son Lee Ming-sang (李明生) who had studied at Chu Hoi College had joined the family business. 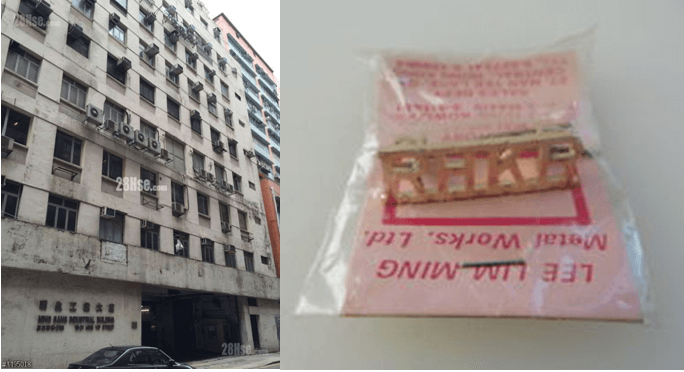 In 1971, Lee Lim Ming built the 12 story, 50,000 sq ft Ming Sang Industrial Building (明生工業大廈, named after his son) at 19-21 Hing Yip Street in Kwun Tong, equipped with two 35000 pounds new industrial elevators that had speed of 150 feet per minute. 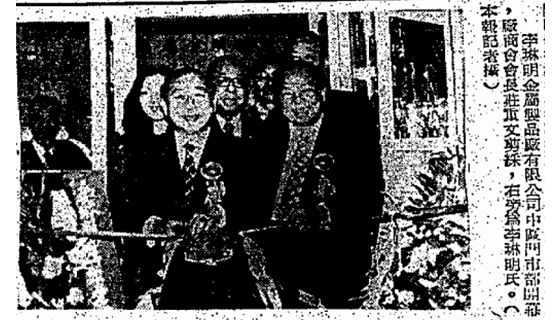 In March 1973, Lee Lim Ming opened a retail outlet on the HK island side on Man Yee Lane next to the Man Yee Building and CMA chairman Chong Chung-men was invited to open while guests at the opening ceremony included Sir Kenneth Fung, Q.W. Lee and other CMA leaders in the metal industry such as C.L. Hsu of Diaward, C.C. Yin of Dah Chung and Choi Cheung kok of Tingtai Hwachong. Outside of work, Lee Lim-ming was very active in community affairs. He served as chairman of the Sze Yup Chamber of Commerce and Yan Ping Industrial & Commercial Association (hereafter refer to as “YPICA”), director and head of investigation committee of the Chinese Manufacturers Association, founding president of the Lions Club of HK East, director of the HK Chinese Club and chairman of the Central Property Owners Association. 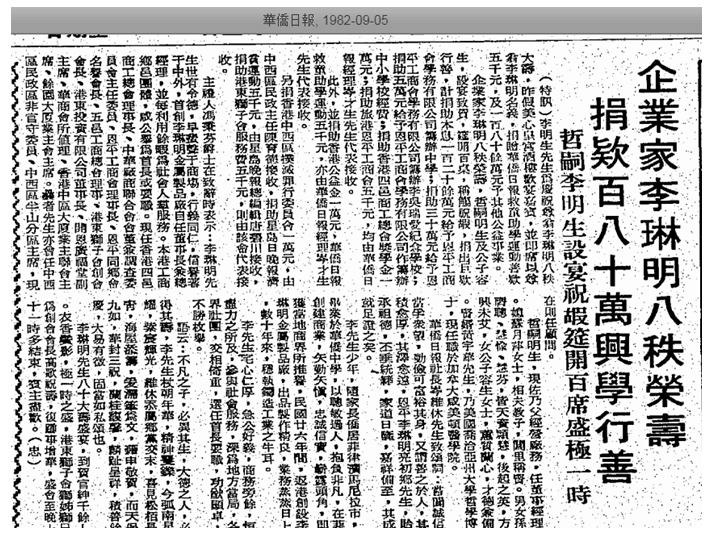 When he turned 80 in 1982, his family organized a large celebration at the Maxim’s Palace in Central with over 100 tables and speeches by Sir Kenneth Fung and Shum Choi-sang of Wah Kiu Yat Po. At the occasion, he donated HK$1.8 million to the YPICA to build schools and the results were YPICA Lee Ng Sui Oi Memorial School (李吳瑞愛紀念學校) in Shatin and YPICA Lee Lim Ming College in Tuen Mun. 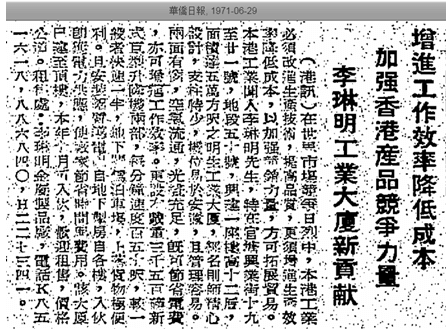 Lee Lim-ming died in 1987 and was succeeded by his son. This article was first posted on 25th May 2018.